I’ve been reading about the ‘DIY-MFA’ this week, and wondering if such a thing is achievable or worth it. An MFA (Master of Fine Arts) roughly translates, for those of us in the UK, as a PhD for the arts: a degree-level period of study, based on two or more years of research, resulting in a final thesis and considered to be the highest level of study for a profession, allowing its graduates to teach. In the US, a programme like this might cost $20,000/£18,000. You can see why people might want to skip that fee. So several alternatives have sprung up, for those working in the creative arts but wanting to take their craft further and deeper. The DIY-MFA idea has a website, a book, and now, new from Ninja Writers, a 1000-day-MFA community based on Ray Bradbury’s list of activities for learning to write well. So what would that involve? 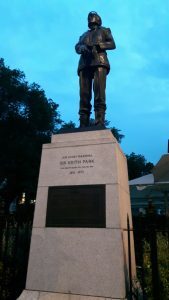 Shaunta Grimes at Ninja Writers unpacks it like this – read a poem, a short story and an essay every day, and write a short story every week. That’s the Ray Bradbury prescription for improving your writing, by the way. Shaunta believes that 1000 days of focused study alongside finishing a work every single week for around three years, will have a huge positive impact on the quality of work produced. I agree – but while choosing stories to read might come naturally to writers – reading widely within your genre, for example, or breaking into works by authors with styles totally different to your own – choosing a worthwhile poem, or particularly, an essay to read, sounds daunting to me. The Ninja Writers DIY-MFA also prescribes, in addition, reading a novel a week for novelists, AND 12 craft books a year. Yikes! That is a lot of reading, and could seriously eat into my writing time. Or.. could it? I’m tempted by this challenge. The nerdy swot in me loves school and anything like school. I am the only person I know who enjoys exams. And what an achievement it would be, to have read 1000 poems, 1000 short stories and 1000 essays, and written around 150 short stories by the end. How much time would it take, and where could I find that time? I instantly know the answer to this: no more facebook whatsoever. I already ditched Pinterest and Tumblr to get more reading and writing done (and it totally worked, by the way – those are time eaters). Do I spend an hour a day on my last remaining attention-guzzler? Hmmn. Maybe I do. An hour of extra reading a day would get the reading part done, but what about the writing? I also spend at least an hour a week critiquing in my writing group. My time is pressed, to say the least, because I also have a day job which involves UK-wide travel and frequent twelve hours days. I do get extra free time in hotels because I don’t have to do the school run, make dinner, do bedtime etc. Top writing tip: get an on the road job! So much thinking time and so much time in hotels with poor WiFi. It’s unbeatable for productivity. So shall I do it? Perhaps I should take only the Ray Bradbury option and aim for a story a week. It would need to be a short story, in the flash fiction line – under 1000 words. But also … I actually would like to read a poem every day. And flash fiction doesn’t take long to read… And I already read or listen to a TED talk most days – I could swap that for an article from a journal. Or I could just count the TED talk as my essay, since they cover every topic. Yes! Another swap or cheat is that I use the Google Newsstand app to read articles from news sources all over the world – probably half an hour a day over meals etc. So I could swap that for something worthy, for writing when I am sitting down somewhere, or as before, just consider that part of my essay diet. Keener people might suggest that I gain writing time by using a dictation app to write whilst making dinner or going for my walk. But (contrary to appearances) I hate the sound of my own voice. So that’s a non-starter. Probably. Maybe I should just get over myself. it might be brilliant. -For factual writing, anyway. I need to see the words on the page for fiction. So I probably do have enough time for this. Next question: what to read? well, I could work my way through the Penguin Book of English Verse that I bought ten years ago. Or I could go to a website like poems.com and let it select my daily reading for me. You may have spotted that there are 13 books on this list. I’m an optimist. Books like Goldberg’s, or Goins’, might be dipped into or re-read several times during the year. 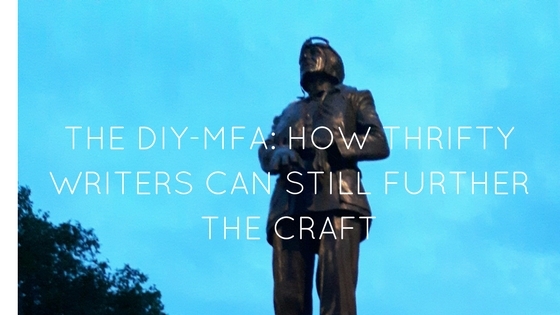 The DIY-MFA isn’t about speed reading, it’s about learning and growing. So am I going to do it, some kind of weird hybrid DIY-MFA / self-improvement fest? I think I might. At the very least I’ll do the reading. And since you can’t learn writing without writing, I guess I’ll do that too. It looks like I’m in – perhaps for 2017, perhaps until 2020. I have doubts about motivation and pace, and about my ability to select books which will truly push me as if I had oversight by a professor. How rigorous could a self-taught ‘degree’ truly be? But Ray Bradbury, and others learned on the job. They took it seriously and made sure they knew everything they could possibly learn about their genre, their predecessors and compatriots, the writing styles and shortcuts available. Bradbury never got a university degree in creative writing. With dedication, then, it is certainly possible to advance. That has to be worth something. And if I don’t read a total of 1000 poems, 1000 books or write 150 stories, then I’ll still be further on than I am now. What are you doing to advance your craft? Are you following a formal programme, paid or unpaid? Have you signed up for any of the DIY-MFA programmes? Or do you just grab opportunities to learn as they arise? Let me know in the comments.